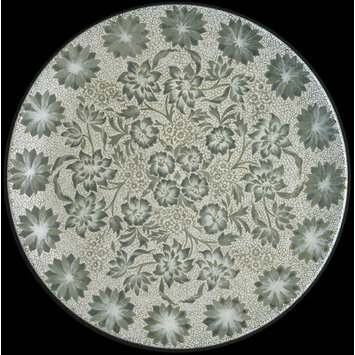 This large decorated dish was made for show only. The blank shape is smooth, uninterrupted and rimless. The Burslem pottery of Pinder, Bourne & Co. would manufacture a run of these dishes, stockpiling them for their own painters or selling them on to other decorating companies and workshops in London, as in this case, and elsewhere. Kate Faulkner has taken full advantage of the surface to produce an over-all textile-like pattern. Kate Faulkner was the sister of Charles (Charlie) Faulkner, one of the original - and most briefly connected - partners of Morris, Marshall, Faulkner & Co. Faulkner was a mathematics don whom Morris had known since his time at Oxford. 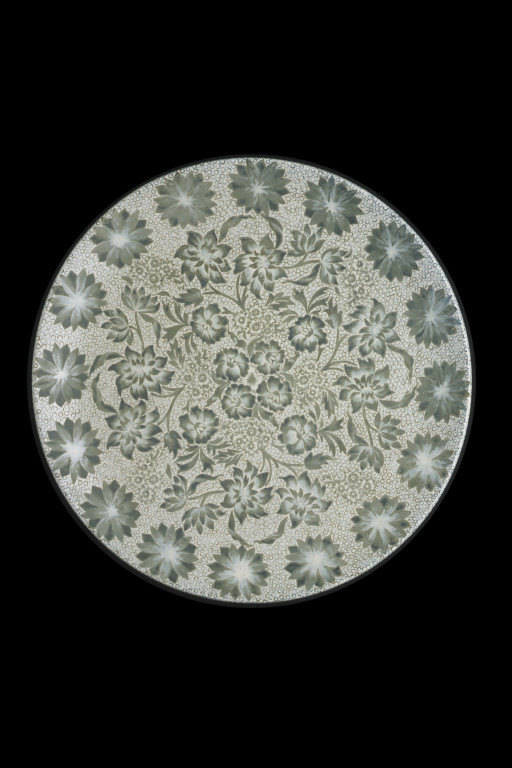 Kate Faulkner's talents as a pattern maker were put to use across a range of the firm's production but this is the only dish known to be by her. Her sister Lucy was a skilful painter of Morris's tiles, particularly specialising in figures.